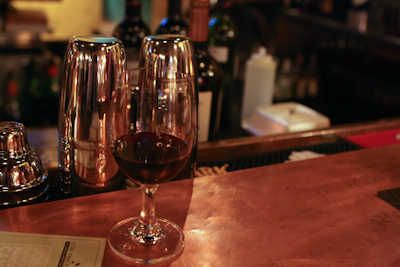 The Starfish Brasserie is smack dab in downtown Bethlehem and is just one of the fine restaurants that can be found in the area. 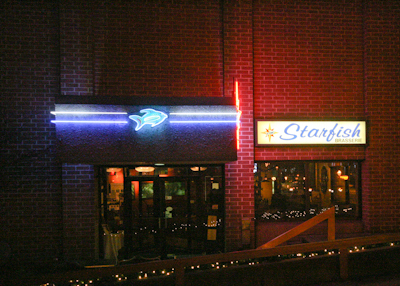 Starfish, as well as Edge and Apollo Grille are what I have always considered to be the triangle of upscale dining in Bethlehem, yet for some reason I never made the trip. After seeing on Starfish’s Twitter that they were doing a special $45, 3 course meal with wine pairings for Pancreatic Cancer Awareness, I decided it would be the perfect time to visit. Since I was alone I opted to sit at the bar, which was a fantastic choice. 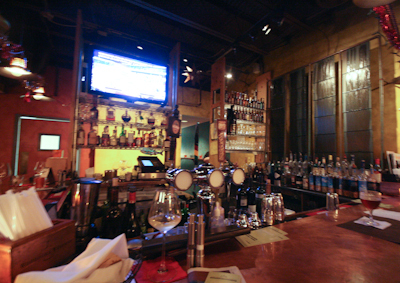 The bar itself is forged of copper, one of my favorite things to see in a decent bar. There’s also a nice waterfall decoration that adds an air of cozyness to the whole place. The first thing I noticed when I sat down was the beer selection on tap. They were offering Colonel Blide’s Cask Ale, the most excellent Founder’s Breakfast Stout, and Bear Republic’s Racer 5 IPA which are all great craft brews. Since I decided to have the bar-sized entree I was able to pick either two appetizers or two entrees. I opted for the two appetizers. For my first I had the cheese plate, which consisted of four different cheeses from the local Keepsake Farms and was paired with a Willamette Valley Whole Cluster Pinot Noir. The four cheeses served were Keepsake’s havarti, blue, smoked cheddar, and gouda. 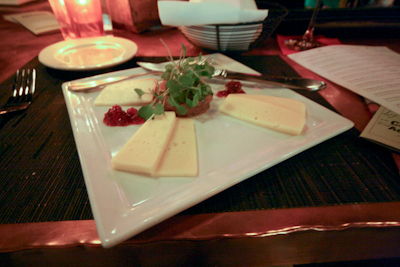 Lingonberries, something I’ve never experience before, were served with the cheese and offered an interesting tartness. The onion jam was intense and well prepared, however I’m not big on onions in general so I opted not to eat the entirety of it. 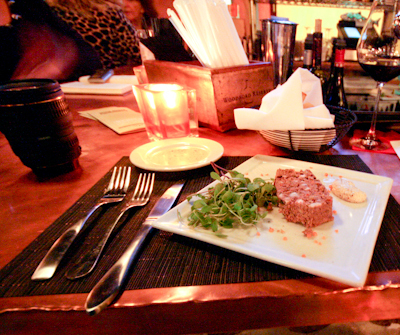 Moving along, it was time for the dish I was most apprehensive about, the kangaroo pate. Now, I’ve had pate before, but only in beef form from a military meal and well, that didn’t go over too well. Based on a certain article about beef pate, it’s no surprise I didn’t like it considering most people can’t discern it from dog food. Regardless, when I heard “kangaroo” I decided I must give it a try. The kangaroo pate was served cold and upon first taste I was met with a strong, yet soft gamey taste that was immensely pleasing. Paired with this dish was a Raimat Vina 43 Tempranillo that matched the dish beautifully. Around this time I started talking to some of the people at the bar about Philadelphia restaurants and the like, so I let the pate get a little more up to room temperature which, in my opinion, made it even better. The pate was served with a sour cream mustard which was surprisingly very spicy, however complimented the taste of the kangaroo most expertly. 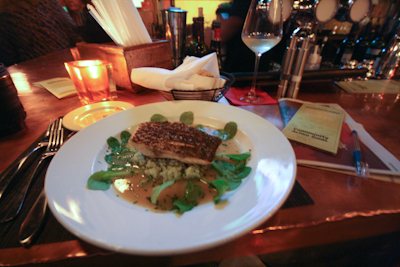 Next up was the entree, the North Carolina striped bass with bamboo rice and bok choy paired with Loredona Viogner. The fish itself, skin intact, was cooked perfectly, however for some reason it seemed a little too fishy for bass. The bamboo rice was delicious and had just the right amount of flavor to it to make is extremely savory. The only complaint I have about this plate other than the fishyness (which I don’t know if that can be contributed to the kitchen) is that there was a LOT of liquid in the plate and kind of watered everything down. I think it would’ve went much better with a drier base for the fish and rice than how it was done. Originally I was going to skip out on dessert because I was quite full, however I somehow made room for a glass of very smooth port and a framboise pannacotta. 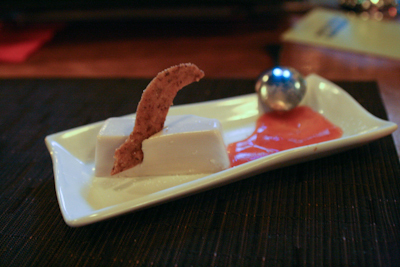 The pannacotta was divine…something like this can go south very quickly if not done right but the dish had a perfect gelatinous consistency and the raspberry sauce put the icing on the cake….or the sauce on the pannacotta. Not only was the food fit for a king, but the service was as well. Since I was sitting in a bad spot at the bar serving-wise, the bartender came around the bar and put the food down in front of me rather than handing it to me over the bar. He was extraordinarily patient and unintrusive when I was talking with people at the bar, even though it had taken over an hour to finish my kangaroo pate. He read off the wines that were being paired with the meals as well as explained what cheeses were included on the plate. He was conversative enough but not over-the-top and even gave the patrons I was talking to and myself a taste of their experimental bacon ice cream, which they’re testing out for a menu line entitled “Breakfast for Dessert”. It sounds weird, but let me tell you, it was delicious. The Starfish Brasserie is definitely worth a revisit, especially since when I paid $45 for a three (really four) course meal with wine, I received a $20 gift certificate as part of the promotion to make a return visit. This was easily one of the best gourmet restaurant values I’ve ever come across in the valley. I also got a chance to speak with the owner on this occasion and one time after visiting and he’s a hell of a nice guy.